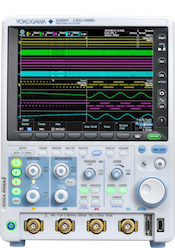 Yokogawa Test & Measurement Corporation announces that it has developed the DLM3000 series of mixed signal oscilloscopes with models for the 200 MHz, 350 MHz, and 500 MHz bandwidths, and will release this to the market on October 30. This new series is a successor to the DLM2000 series of mixed signal oscilloscopes, which have sold well thanks to their combination of low cost, light weight and compact size, high functionality, and ease of use. The DLM3000 comes with new functions that meet the latest needs of customers who are developing technologies for electric vehicles (EVs) and power electronics. By combining this product with its ScopeCorders and power analyzer products, Yokogawa will be able to offer optimum solutions for developers who are engaged in these fields, and thereby expand its measuring instrument business. In recent years, increased intention has been paid to the topic of sustainability, and this has been driving the move toward more energy-efficient power electronics, car electronics, and mechatronic devices. Released in 2008, Yokogawa’s DLM2000 series mid-range mixed signal oscilloscopes have proven popular with developers of power electronics, car electronics, and mechatronic devices. In particular, their ease of use thanks to features such as a history function*1 have been well-received, and they have established a solid track record in the marketplace. However, customer needs continue to evolve and there is now a need for solutions that can help to improve power efficiency and speed up product development. To meet these needs, Yokogawa has improved on the DLM2000 by redesigning the hardware and adding functions that greatly improve performance. The DLM3000’s new functions meet the latest needs of companies that are developing EVs, advanced driver-assistance systems (ADASs), and inverter-related technologies. The models in the DLM3000 series support either two-channel or four-channel input. Even when simultaneously measuring input from every channel, each of these models can maintain a maximum sampling rate of 2.5 G/s (giga sampling/second), two times faster than the DLM2000 series. With the improved hardware design, residual noise has been reduced 50%, the measurement sensitivity setting range has been extended to 500 μV, and the maximum input voltage has been extended to 300 Vrms. These features enable the DLM3000 to accurately observe signal waveforms over a wider voltage range. The high-speed measurement of signals over longer periods of time generates a great volume of data. The DLM3000 supports the USB3.0 standard and thus is able to transfer large amounts of data at high speed for storage on a PC. The DLM3000 user interface inherits many of the features that have been well received in other Yokogawa products, but now includes a capacitive touchscreen that offers the same intuitive ease of use found in modern smartphones. To speed up the development of EVs and ADASs, the DLM3000 comes with a trigger function*2 that supports the CAN with Flexible Data-Rate (CAN FD) and CXPI in-vehicle LAN standards. As both the waveform data captured with the trigger function and the signal analysis results can now be displayed on the same screen, users can identify at a glance the relationships between these two sets of data. The DLM3000 also satisfies engineers’ need for more efficient debugging. The DLM3000 is able to store up to 500 M points of acquired data, which is twice that of the preceding Yokogawa oscilloscope series and more than any other mid-range mixed signal oscilloscope on the market today*3. With this function, the DLM3000 history function can retain up to 100,000 waveforms, twice that of our preceding series. The number of waveforms that can be searched and compared has thus been doubled, for improved efficiency in debugging. Furthermore, a 60 GB SSD*4 can be installed for additional data storage capacity. *4 A data storage drive system that uses flash memory. An SSD offers faster reading and writing speeds than a conventional hard disk drive.